The resistance bands is a simple and cheap gadget, thanks to which you will perform a full-fledged workout in the privacy of your home. They are valued primarily as support in back training, however, this is not the only way to use them. Find out what else you can gain from tape exercises! 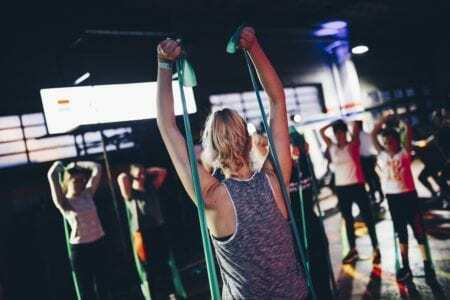 What are exercise resistance bands? Rubber training tapes come in the form of ordinary, longer bands that allow you to practice different parts of muscles. This is a device commonly found in gyms and fitness clubs. Their advantages are above all versatility, low price and the fact that almost every training can be made more effective by forcing muscles to greater effort. Training tapes are an excellent device for people who do not have time to visit the gym, but they want to maintain a good figure through home training. It is worth adding that, in addition to muscle strengthening, sports tapes will also improve your coordination. Rubber training tapes are often confused with the expander. Meanwhile, this second device, apart from rubber elements, often includes additional springs, handles and cables. The expander is also much more expensive than a rubber band and dedicated to more experienced athletes. How to choose the right tape? The choice of exercise tape should depend primarily on your skills and strength. What matters here is the resistance that the tape puts – it depends on its thickness and length. Remember that the wider and thicker the tape, the harder it gets – it means that it will require more strength from you. It is also worth remembering that one training tape is not enough if you want to practice many body parts – it’s worth getting 2-3 pieces with different resistance. Pay attention to the material from which training tapes are made. All of them should be made of latex, which is very stretchy and resistant to cracking. How to exercise with rubber tape? The tape will help you in many exercises. You will do with it both stretching and strengthening exercises for the back as well as effective training of the legs and arms. First of all, rubber tapes should be included in general training, diversifying them with popular exercises (example: put the tape on your feet during the so-called scissors exercise, to force your muscles to work harder). Training tapes will give you much faster results. Exercises with resistance bands are especially recommended for swimmers. Perfectly strengthen the muscles of the back and shoulders. The advantage of rubber training is that you can exercise with it even at the pool. Training rubber is a popular exercise device for pilates and yoga. Thanks to their versatility, they successfully replace weights, allowing effective exercise of the abdomen, buttocks and hands. Rubber tape is also recommended in back muscles exercises as well as an addition to rehabilitation. Fitness elastics are also useful for people who lead a sedentary lifestyle and want to bring some relief to their spine. Exercises with the tape strengthen not only the muscles that surround it, but also the deep abdominal muscles, which play an important role in maintaining the correct posture. Turn on the training tape as part of any stretching exercises on the spine. The simplest exercise with the tape you can do is to grab it from both sides and stretch it to the shoulder width, firmly pull the shoulder blades and extend the straightened arms in front of you. Hold in this position for 20 seconds and repeat the exercise 10 times. I guarantee that your spine will be grateful! Previous PostPrevious Is Listening to Music Good For Your Health?